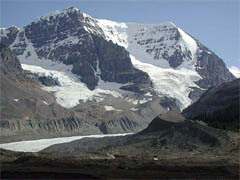 The Athabasca Glacier in western Alberta, one of six fed by the Columbia Icefield, the largest in the Rockies. Along the glacier's edge, 200-year-old snow is now melting. "This wondertrail will be world renowned," a surveyor predicted in 1920 when Highway 93 North was only a daunting idea. When it opened 20 years later, thanks to a Depression public works program, The Banff Crag and Canyon crowed, "20 Switzerlands in one." Without debating the relative merits of the Alps and the Canadian Rockies, 93 North, better known as the Icefields Parkway, is undeniably a "wondertrail." Stretching from Lake Louise to Jasper, its 143-mile length affords constantly changing views of more than 600 glaciers, six icefields and a cornucopia of mountains. When I boarded a bus one July morning in Banff for a 10-hour guided ride to Jasper, I knew I was choosing a window seat at the cushy, some would say wimpy, end of the parkway spectrum. But for those of us who daydreamed during geography class and need to give our full attention as drivers to the road ahead, not the peaks at the side, a bus tour solves more than one problem. And this particular tour company, Brewster, comes with a pedigree: its founders, Jim and Bill Brewster, began outfitting and guiding travelers through the Rockies at the turn of the 20th century. We were a group of 16, from Korea, New Zealand, Canada and the United States. Terry, our driver-guide, was tall and outgoing, maybe a little humorous for 8 a.m. but a born teacher. After outlining the bus's safety features — "There are lots of ways to exit if you get tired of my commentary" — he showed us how to identify the main-range mountains that line the Icefields Parkway (horizontal layers of varied, sometimes deeply colored rock). 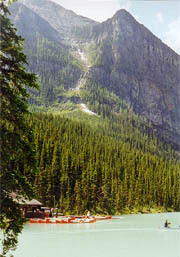 In the half hour between Banff and the start of the parkway, at Lake Louise, I learned the difference between the montane, sub-alpine and alpine regions, and how the glacial lakes got their intense color: The glaciers grind up rock into fine particles and the light reflected off the so-called rock flour suspended in the water produces the brilliant blue-green. Terry pointed out a sodded wildlife overpass that allowed cougars, wolves, coyotes and bears to cross the Bow Valley as they have for 10,000 years. At Lake Louise, where we had a half-hour break, I dipped into the old railway hotel, now called the Fairmont Chateau Lake Louise and somewhat Swiss-ified inside, for a muffin. But I spent most of my time strolling the lakeshore, with Mount Victoria in the background, happily aware of the rock flour beneath the turquoise surface. Back on the bus, our speed was deliberate enough for us to spot purple asters and scarlet Indian paintbrushes (castilleja) in front of the lodgepole pines that border the road. The mountains come with various profiles — the craggy Dolomite Peak that Terry calls the Clint Eastwood Peak, the mesa-topped Bow Peak with its multicolored quartzite striations. 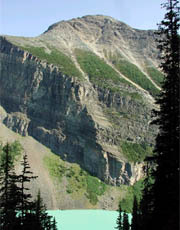 (Bow Peak gets its name, Terry told us, from the Douglas fir that grows on it; the Indians used the saplings for bows.) The glaciers that ooze down their sides look like the thick marzipan frosting Canadians put on fruit cake. Our first impressive glacier, Crowfoot, necessitated a stop. 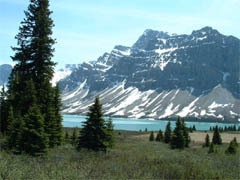 Snow trapped by Crowfoot Mountain's upper cliffs hardened into glacial ice and flowed down in the shape of a crow's three splayed toes. (One of the toes fell off in the 1920's.) Making my way between giant ravens at the lookout over Bow Lake, I realized that a glacier is at its prettiest when it is far away. From a middling distance, in contrast to the noble-looking mountain, it is mostly dirty, dun-gray scree. Our next stop, not far away, was Bow Pass, at 6,800 feet the highest point on the parkway. A self-guided interpretive walk through the upper subalpine forest opened my eyes to the flora and fauna that cope in this windy, snowy clime — mountain heather, alpine forget-me-nots, fir and Engelmann spruce, gray jays and Clark's nutcrackers. On the quiet, moss-lined path, the dark stands of fir and spruce and the limited splashes of pink, yellow and white heather give this place an almost Japanese austerity. At the viewpoint over Peyto Lake, the mountains overlap in a stately ensemble, while their peaks, at 11 a.m., are lost in mist. Back on the bus, as we traveled through the Mistaya River system and dropped down, at the Saskatchewan Crossing, to the lowest point on the highway (4,500 feet), Terry' s running commentary was a varied, digestible diet of geology and explorers. The latter humanized the former, especially as the mountains' cumulative majesty threatened to become almost too dazzling. The feats of intrepid mountaineers like David Thompson and Mary Schaffer underscored our pusillanimity, but I for one was grateful to view Mount Patterson, with its hanging glacier, and Mount Chephren, looking like an immense pudding mold, in comfort. Trembling aspens, their leaves shimmering in the light like sequined dresses, appeared now that we were in the montane region, about 5,000 feet. The mountains, in somberly romantic blues and apparently dozens of greens, took on unexpected shapes — a big, gable-roofed barn, a series of squarish tops that resemble Greek temples, with vertical striations suggesting columns. By lunch time, we'd climbed out of the lowlands into the day's main event, the Columbia Icefield. About 125 square miles (the size of 95 Central Parks), the Columbia nourishes six major glaciers and is the Rockies' biggest icefield. We had two and a half hours at the Icefield Information Center, and I'd booked a tour that would take me onto the Athabasca Glacier. 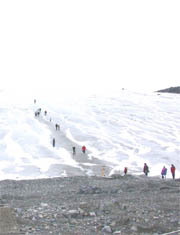 Intellectually, I was impressed that life on the icefield remained pretty much as it was during the last ice age 11,000 years ago and that 200-year-old snow was now melting at the glacier's edge. Physically, I was cold, because an icefield makes its own windy, frigid weather. I had a flannel shirt and jacket, but a hat and mittens would have been welcome. More than anything, I was struck by the prevailing bleakness. The moraine was gray, the ice grimy with debris. Even the food in the crowded cafeteria was dismal — tepid, slightly sweet vegetarian pizza. In what seemed partly a moonscape, partly an industrial wasteland, we shuffled on and off a shuttle bus to an Ice Explorer, an all-terrain vehicle with tires five feet in diameter. Alex, our guide, was a handsome, strapping Englishwoman and, like Terry, a teaser. To my mind, the scene was desolate, but Alex told us it was a gorgeous day and explained how glaciers formed by spilling out of the overfull bowl that is an icefield. Out on the glacier, with a mean wind insinuating itself around us, we were warned about the dangers of crevasses. I picked my way cautiously over snow veined with dirt, but the blue-tinged water in rivulets and holes looked preternaturally clean. The glacier that hangs on the mountain still looked like marzipan, but cracked and fissured. Everyone was taking pictures, and I thought, if an avalanche buried us, archaeologists in the future would point to the cameras as an essential part of our religion. A Japanese man came back on the bus with a plastic container of glacier water. Pondering the icefield's unloveliness, I remembered Edmund Burke's concept of the sublime, which I learned about in graduate school. Unlike the beautiful, the sublime is compounded of terror, astonishment and various kinds of deprivation. Frightening and occasionally ugly, it inspires awe rather than euphoria. The icefield is alien and inhospitable; it makes no allowance for humans, but it's undeniably sublime. I wouldn't have missed it. WE rejoined Terry and the bus, following the Sunwapta River. 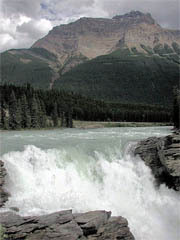 We admired Tangle Falls, named for the untracked bush or "shin tangler" Mary Schaffer negotiated on her detour around Athabasca Glacier in 1907. We saw the salt lick on Mount Fryatt — the salt helps the mountain goats' new coats grow. On the other side of the road, Mount Kerkeslin looms up, and we'd just passed Mount Christie and Mount Brussels. At points like this, and they were frequent, I felt as if I was at an overstimulating cocktail party, surrounded by hordes of intriguing strangers. I couldn't possibly keep all these fascinating mountains straight! At Athabasca Falls, we had 25 minutes to explore an arresting scene. The roiling 75-foot waterfall has been pummeling through some of the area's hardest rock, Gog quartzite, for 10,000 years. Warned by a sign announcing that a man recently fell from the bridge and was lost in the falls, I looked gingerly down at sharply layered bedrock, bronze-colored pillows of moss and thundering water. Spinning particles of salt, silt and gravel, I read on the park sign, have worked like diamond drills, carving out potholes and tunnels. I threaded my way through a narrow, abandoned channel, walking back in time through incised rocks that looked like wide-waled corduroy on the horizontal. At 5:40, we reached Jasper, where we were dropped off at our several hotels. Shifting from nature to the works of men was an adjustment, and I cushioned the blow with a guidebook to the old railway town, called "Jasper, A Walk in the Past." Aside from some charming early buildings of local stone and stucco, my favorite is the former Catholic Church where Bing Crosby sang in the choir whenever he visited Jasper. The drive back to Banff the next day was quieter and shorter, slightly under six hours. There was a moment of excitement, when the driver shouted "Grizzly!" The bear, with a dark head and cinnamon body, munched placidly on a shrub while cars stopped and cameras clicked. Covering the same territory in reverse might sound repetitive, but only to those not sensitized to the infinite variety of the Parkway. There's always something new in this elemental landscape — a river broadens or narrows, changes from chortling to sluggish; the weather in its mountain fickleness shifts from rain to sun, coloring peaks a rosy pink or picking out the delicate streaks of snow on gray stone; a mountain wrapped in fog throws it off just as we pass by, in a bravura farewell. Brewster Vacations (403) 762-6717, fax (403) 762-6750, (800) 661-1152, www.brewster.ca, charges $374.60 at $1.25 Canadian to the U.S. dollar for a round-trip Banff-Jasper tour, including Ice Explorer ride and one night's stay in a midprice Jasper hotel.